Rapid Cabs and the W.I.T. Students’ Union have one message for students this year and that is Don’t walk home alone. The scenario is not uncommon. You’re a student of W.I.T. and out for the evening. You’ve run out of money, lost your wallet or purse and it’s time to go home. However, now you can get a taxi with Rapid Cabs rather than walking home on your own. Just leave your WITCard with them and pay your fare when you collect it the next day. “Waterford City does not differ from any large urban environment, it is no safer or more dangerous that any third level City, but people need to plan their night out, and that includes getting home”. 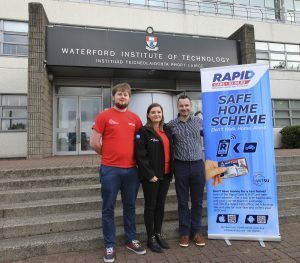 The ‘Safe Home Scheme’ is now in place and will be promoted through-out the Institute campus and on local radio.